John Witherspoon had a close working relationship with Samuel Adams. They both stayed in the Continental Congress when all was in a shambles as well as in great success. 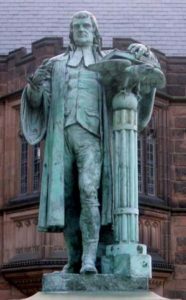 From his Pastor and military Patriotism in Scotland to his statesmanship in New Jersey and the Continental Congress, he was stronger in his faith. Witherspoon was consistent in the extensibility of the Gospel. He elevated Princeton to greater recognition than it ever experienced. He was the mento and teacher to many great political minds. In all, John Witherspoon is the well rounded example of a Patriot Pastor that helped establish this nation. He is one of my all time favorites.